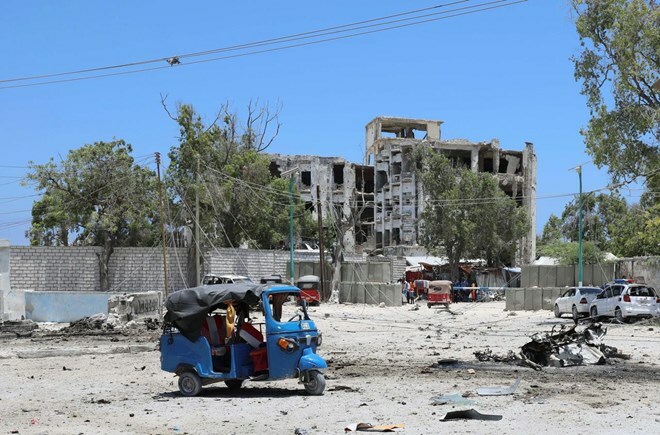 MOGADISHU (Reuters) – Somalia’s al Shabaab stormed a government building on Saturday, detonating a suicide car bomb in the heart of the capital Mogadishu with at least 15 people, including an assistant minister, killed during the ensuing gun battle. In the latest bombing claimed by al Shabaab, an Islamist group which is fighting to establish its own rule in Somalia, based on a strict interpretation of sharia law, a huge explosion shook central Mogadishu and a large plume of smoke rose above a building housing Somalia’s ministries of labor and works. Abdullahi said ten people, including assistant labor minister Saqar Ibrahim Abdala and police personnel, had died. Dr. Abdikadir Abdirahman, director of Amin Ambulance Service told Reuters soon after the assault begun that people were trapped inside the building and that it was not possible to rescue them because of a heavy exchange of fire. “We are inside the building and (the) fighting goes on. We shall give details later,” Abdiasis Abu Musab, Al Shabaab’s military operation spokesman said during the attack. But it remains a threat, with its fighters frequently carrying out bombings in Somalia and neighboring Kenya, whose troops form part of the African Union mandated peacekeeping force AMISOM that helps defend Somalia’s central government.